After a slow and technical heads up much that saw some hands take as long as ten minutes to complete, Jason DeWitt got the better of Sam Trickett to win event No. 17 and $818,959. DeWitt moved all in from the button having Trickett easily covered. Trickett called and showed A 7 . DeWitt held 10 8 and was a slight underdog. The flop came 8 6 5 , pairing up DeWitt to give him the lead. Trickett held an overcard and a straight draw. The turn was the 6 and the river was the 5 , and DeWitt won his first WSOP bracelet and $818,959 in prize money. 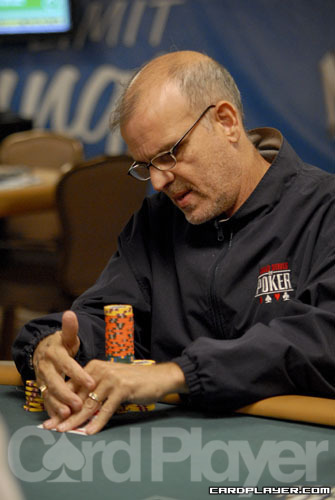 Trickett earned $505,725 for his runner-up finish. Peter Gilmore appeared to be in good shape when he got his last 1.18 million in holding A K against Sam Trickett’s A 10 . Things looked OK through the turn too, running J 8 Q 8 . But the river was a nightmare for Gilmore, as the 9 gave Trickett a straight, knocking Gilmore out in 4th place, for which he earned $241,472. Trickett regained a lot of chips, holding around 5 million after the hand. Jeff Williams was short on chips and forced to push all in for 940,000. He was called by Jason DeWitt and the two showed down. The board of 4 2 10 K Q didn’t improve Williams’ hand and he was gone in 3rd place. He won $328,762. The elimination left Jason DeWitt and Sam Trickett heads up. DeWitt held 6.8 million to Trickett’s 4.9 million. David Benefield moved his last 565,000 all in and got a call from Sam Trickett and Peter Gilmore. Action was checked down by the two other players and they showed down. Trickett’s aces took the pot and Benefield was gone in 6th, making $135,718 for his efforts. Following Benefield’s departure was Amit Makjija. Pushing is last 1,030,000 in from the button, Amit Makhija was called by Sam Trickett, who had him covered. The board ran out J 9 4 A 10 and Makhija was gone in 5th, taking $179,866 in prize money. Trickett had more than 6 million after the hand. The board came K 4 7 4 6 and Foltyn was gone in 8th place. DeWitt was back up to 1.9 million after the hand. In a huge pot, action was three-bet before James Carroll got his 1.225 million all in holding K K , only to be called by Jeff Williams who held the dreaded A A . The board came 6 9 10 2 3 and Carroll was gone in 7th place, taking home $103,594. Williams had more than 4 million after the hand. The remaining 8 players are on a 60-minute dinner break. Stay right here on CardPlayer.com for your final table coverage. Short on chips, Manny Minaya pushed his last 191,000 to the middle of the table and Jeff Williams called from the button. Minaya showed A 8 and looked to be in trouble against Williams’ A 10 . The flop came A 2 K , pairing both players, but Williams’ 10 still factored in as better kicker. The turn came 10 , giving Williams two pair and leaving Minaya drawing thin to a chopped pot. But the river was the J and Minaya was the first elimination from the final table, taking home $62,350. Williams had around 2 million after the hand. On a flop of A 5 2 Peter Gilmore bet 110,000 and Jason DeWitt check-raised to 260,000. Gilmore moved all in and DeWitt called, with Gilmore covering DeWitt in chips. DeWitt had to be pleased to see that his A A was well ahead of Gilmore’s drawless A Q . The 6 turn and Q river changed nothing and DeWitt’s stack soared past 2.5 million, giving him the chip lead. The final table is officially set for event No. 17, $5,000 no-limit hold’em. Stay tuned to CardPlayer.com for elimination updates. The average chip stack is 660,000. Players will return at 2:30 p.m. PST with blinds 6,000-12,000 with a 1,000 ante and play down to a winner.